↑ "Tim Duncan Q&A". slamduncan.com. Retrieved January 25, 2008. ↑ "Tim Duncan's prolific career draws praise from NBA stars". Associated Press. July 12, 2016. ↑ "Tim Duncan". Basketball-reference.com. Retrieved May 20, 2008. ↑ "Tim Duncan Earns All-NBA And All-Defensive Team Honors For 13th Straight Season". NBA.com. May 6, 2010. Retrieved May 8, 2014. 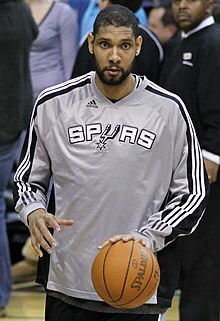 ↑ "Tim Duncan – Bio". NBA.com. Archived from the original on August 14, 2007. Retrieved August 25, 2007. ↑ Kernan, Kevin (2000). Slam Duncan. p. 19. ISBN 978-1-58261-179-2. ↑ "Mark R. Leary Personal Trivia!". Retrieved June 22, 2013. ↑ Haynes, Danielle (November 23, 2013). "Tim Duncan divorce made official in private hearing". UPI. Retrieved December 27, 2013. ↑ Mendoza, Madalyn (March 27, 2017). "Tim Duncan welcomes third child". My San Antonio. Retrieved June 7, 2017.